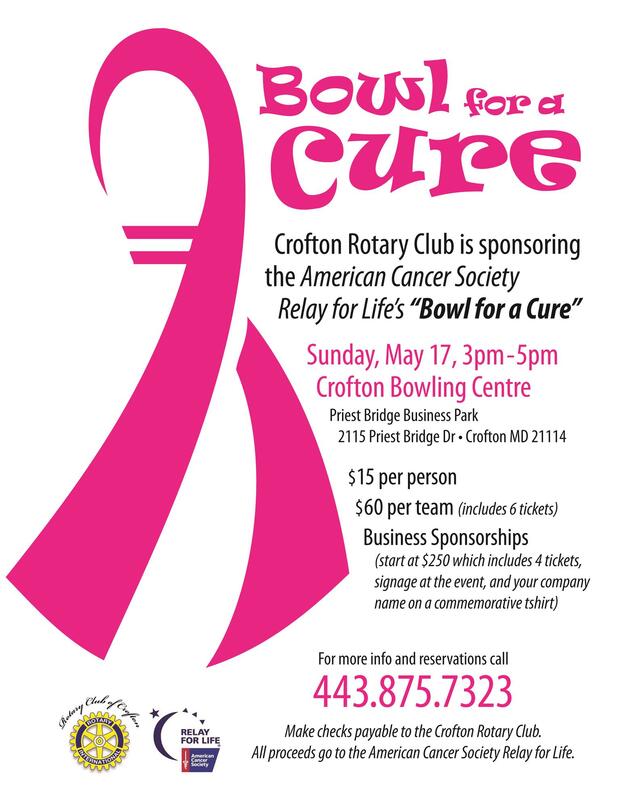 The Rotary Club of Crofton is sponsoring the "Bowl for a Cure" Fundraiser to benefit the American Cancer Society Relay for Life event at South River High School. The fundraiser will be held on Sunday May 17, 2015 from 3-5 pm at the Crofton Bowling Center. Business sponsorships are $250 and include signage at the event, 4 bowling tickets and the company name on a commemorative T-shirt. We are also selling individual tickets to the event for $15 each or $60 for a team of 6 bowlers (includes 6 tickets). Please see the attached flier for details.